The road goes on forever, Gregg Allman sang in Midnight Rider, and that's the feeling I get from listening to Michael Chapman's glorious new night drive of an album. Called 50 in celebration of that many years of professional music-making, it feels like every lived minute is somehow contained in its 10 songs, including the one questing instrumental. Chapman's voice is a bit shot, all husky burr and weary bite, but he's been mastering its unconventional qualities since his first album and is completely in control of its contours here. About half of these songs are remakes from earlier Chapman albums, but that hardly matters if you are a new listener - and I expect he'll get more than a few of those with 50. Some of them will be drawn by American guitar maven Steve Gunn, who produced the album and assembled the expert and empathic crew of players who surround Chapman with airy but sturdy skeins of acoustic and electric stringed instruments and keyboards. Chapman's longtime collaborator Bridget St. John, a British folk luminary herself, is also here, limning his dry voice with her burnished gold on several tracks. The old and new songs combine to timeless effect, many of them lyrically reminiscent of Bob Dylan in apocalyptic mode: "And the preacher comes in from the cold, his wisdom to disperse. I listen to his sermon, but he's making matters worse" (The Prospector). Or "Trees caught fire, sky turned red, fish in the river turned up dead" (Sometimes You Just Drive). Chapman also has a nice sideline as a poet of failure. One of his greatest songs is called It Didn't Work Out, and another classic tune turns it's title, It Seemed Like A Good Idea At The Time, into a wry sing-along. We get some of that here, too, in That Time Of Night: "When nothing seems to turn out right, and dreams can drift right out of sight, because it's that time of night." And the failures are not only personal. Chapman has called this his "American album," and I think that is not only a reference to the provenance of his fellow musicians or where it was recorded. 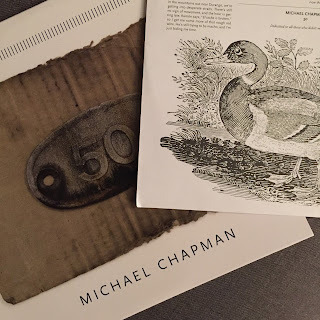 Though of English origin himself, that the 75-year-old Chapman is a keen observer of life on this side of the pond becomes very clear on songs like Memphis in Winter: "They say that Jesus saves, but I see none of that down here. I just see people with the hunger, I see people with the fear. And I can see the jungle growing, hobos huddled in the steam. Are they just some hungry mouths to feed or the bitter end of the dream?" Or I could just be projecting my own current perspective on some of these songs - perhaps in 10 years it will all sound very different, just good poetryt instead of feeling ripped from the headlines. 50 is an album for the ages in any case, and I am sure I will still be listening further down the road in my own journey. With music, of course! Even activists need a soundtrack, after all. Here are some things to look forward to - and some ways you can keep up with what I'm tracking in all genres. 1. The Return Of Fleet Foxes Over the traditional holiday Chinese dinner, I asked the assembled if they had something positive they anticipating in 2017. My nephew spoke first, and without hesitation: "New music from Fleet Foxes." Yes, many of us said, nodding, and I don't remember what anybody else said. While there are few exact details, Robin Pecknold has indicated that something new will be coming out under the Fleet Foxes name in 2017, presumably including some of the new songs he's played on tour opening for Joanna Newsom. There will also be U.S. concert dates, the first of which has been announced: Opening day at the Newport Folk Festival. Nothing fancy - and already sold out. Maybe I'll build a raft and listen from the bay. 2. Father John Misty's Next Sermon The sage of Laurel Canyon has already announced his third album, Pure Comedy, and released three songs. Jonathan Wilson was once again in the producer's chair and probably played most of the instruments. Preorder here for delivery right around April Fool's Day. And it will be good. The only mystery is who will be taking his place as the drummer in Fleet Foxes. 3. The Beck Comeback? Beck has been promising a follow-up to 2014's Morning Phase at least since that brilliant album won Album Of The Year at the Grammys. Based on Dreams and Wow, his last two singles, this will be the fun side of Mr. Hansen. Don't mark your calendar but do sign up for updates so you don't miss a lick. 4. Spoon Get Hot Pretty much anything Britt Daniel touches turns to gold in my book so I'm eagerly awaiting the release of Spoon's Hot Thoughts, their ninth album, due March 17. 5. ACME Reach For The Peak The American Contemporary Music Ensemble seems to be cooking something very special up for their debut on the excellent Sono Luminus label. Called Thrive On Routine, it promises to be anything but. Catch a preview by listening to In A Treeless Place, Only Snow, a magical piece by John Luther Adams. Coming on February 24th - preorder here. 6. Pusha T's Game Of Thrones King Push, the follow up to My Name Is My Name, has been promised since 2014. So far we've just gotten Darkest Before Dawn: The Prelude, which was supposedly songs that didn't fit on King Push. Many of those were fantastic, only whetting my appetite further. The master rapper has been busy mastering the boardroom while running Kanye West's G.O.O.D. Music label, which might account for the delay. If the one new song Push put out in 2016 is any indication, expect more fire. 7. Goldfrapp's Sound Of Silver I've missed the whomp of Alison Goldfrapp and Will Gregory's hyper-melodic electro-glam for a while now - even on their last album. However, based on their new single, Anymore, they may be bringing back the sound that once rocked stadiums (at least in the U.K.). We'll find out soon enough when Silver Eye is released on March 31st. 8. Noveller's Next Chapter Video clips from the studio show Sarah Lipstate, a wizard of guitar looping and layering, honing her style to a fine point. Such refinement will surely be reflected on her third album, A Pink Sunset For No One, out this Friday, February 10th. 9. Leon Parker's Stealthy Return One of the finest jazz percussionists alive, Parker has been mainly active in France in recent years and hasn't put out an album since 2001. Once or twice a year I Google around, looking for news, and this year (on the third page of search results!) I found it: Parker will be playing in pianist Aaron Goldberg's trio at Dizzy's Club Coca Cola on March 15th and 16th. I'll be there and if we're lucky we'll get treated to an original from one of his terrific albums - Belief is my favorite. Here's one reason why. 10. Oh, Jenny O. In 2013, Jenny O. released Automechanic, a gem of an album featuring indelible songs, great vocals, and Jonathan Wilson's highly detailed production. It was my number three album of the year so naturally I'm majorly jazzed to hear that Jenny and Jonny (along with engineer Bryce Gonzalez) are back at it for Peace & Information. The release date is up to YOU as she is self-financing the release on Kickstarter - be a backer today. I'm still hoping to see her perform with a full band, so that's another thing to look forward to in 2017! Every year, I dump anything in which I'm vaguely interested into an Of Note playlist on Spotify so I can keep track. But it finally dawned on me that having a 27 hour multi-genre playlist (as 2016's edition was by the end of the year) was not very good customer service. What if you hate avant garde classical music? What if all you want to hear is hip hop? Why was I making everyone wade through my schizophonic obsessions?? No more. This year, I have started sorting by genre right from the beginning and have so far established the five specific playlists listed below. Other ones may pop up if it becomes a very strong year in another genre, such as reggae or jazz. I hope this makes it easier follow only what grabs you. As for anything not on Spotify, I'll be spreading links to sounds on Bandcamp, Soundcloud, YouTube, etc., on Facebook, Twitter, and Instagram, so make sure to connect with me on those platforms. As always, keep me in the loop on what I'm missing!